Adding essential oils to your green cleaning kit is an easy way to make your homekeeping routine more effective and enjoyable. I love essential oils because their aroma therapeutic benefits make the chore of cleaning way more tolerable, even healing. I also love essential oils because many of them have antimicrobial properties which are great when dealing with really gross messes. I don't have a huge budget so I stick to these five essential oils. I find them to be more than enough for both household use and personal care. Tea Tree: This Australian essential oil is a cleaning superstar with a strong kung fu kick of antiseptic! I love adding a few drops of it to a spray bottle filled with diluted Dr. Bronner's in order to clean bathroom and kitchen surfaces. It's also helpful with dealing with mold in the bathroom. Lemon: I swear, one whiff of lemon and I'm ready to do practically anything with a smile! This refreshing and uplifting essential oil also has antibacterial properties. Green Cleaning Coach Leslie Reichert shares a recipe for simple all purpose cleaner with lemon in the video below. Peppermint: This energizing and calming oil just makes me want to get up and do things! Honestly, I just take a whiff when I need to get motivated. I just discovered today on eHow that peppermint oil is also useful for pest control, including that of mice. As someone who lives in a really old house with a lazy cat, this is incredibly useful information for me. Eucalyptus: Everyone seems to agree that eucalyptus essential oil is the perfect cover up for the funky smell of vinegar so I add a few drops of it to vinegar when cleaning for clients. I add this to my bath salts when I'm congested. 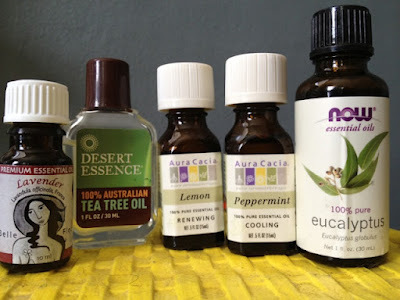 GreenLivingTips.com recommends at least a dozen other uses, including: Add 1-2 teaspoonfuls of eucalyptus oil to your load of washing for a fresh scent along with the antimicrobial benefits. Lavender: Lavender is an antimicrobial that was used in Medieval times to ward off illness. Despite this, I don't use it much for cleaning. I guess because I associate the smell with sleeping. I save this calming essential oil for adding to coconut oil or aloe for my hair. I also add some to epsom salts for my bath. Notes: My herbalist friend Liz, of Raganella.com, always points out that essential oils should be used mindfully, as it takes a tremendous amount of resources to create them and because they are really strong. According to RealSimple, one drop of peppermint oil is as potent as 30 cups of peppermint tea! If you'd like to continue nerding out on essential oils, visit AuraCacia.com for detailed profiles of over 50 essential oils, including aromatherapy benefits, safety info, recipes for household and wellness uses, and more. What's Better: Digital or Paper Planners? How Long Can You Keep Spices?